Last but not least! 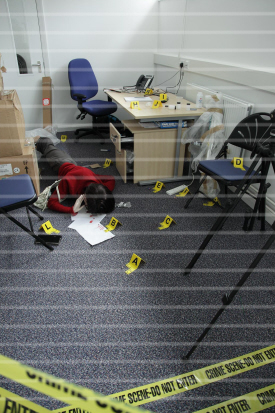 Assessing the risks to the CSI's health and safety when he or she begins to process the scene in which hazardous substances or other dangers may be present is vital. Those dangers could include loose flooring, or sharp objects such as broken glass, or even the presence of the perpetrator of the crime who might be in hiding, or simply remaining in the area to "see" whether their actions have been discovered! The CSI must take all necessary steps to minimise harm to by complying with the relevant legislation such as The Control of Substances Hazardous to Health (COSHH) Regulations, or The Dangerous Substances and Explosive Atmospheres (DSEAR) Regulations, and others. Details about these regulations can be found HERE. Only when the CSI is satisfied that they have all the information they need to safety process the scene will they begin to do so. A plan of operation is developed and initiated following the initial “walk” through of the scene.